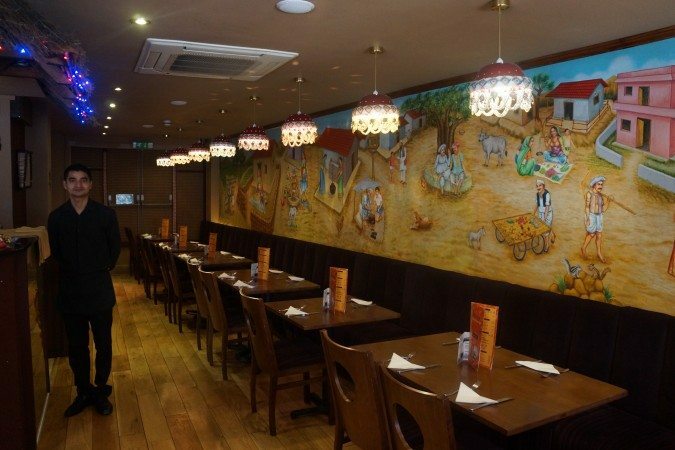 An authentic Indian tucked away in the Lanes on Little East Street, Chaula’s is known for its continued success in delivering ‘the food of India’. 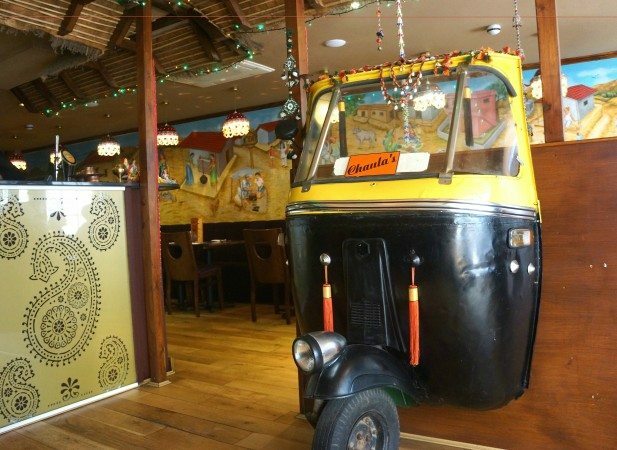 After reading more about its charming backstory from reviewer Sarah Gathercole, I knew I couldn’t refuse an offer to try their latest lunch menu, and with an indian origin myself, I was more then intrigued to see if it lived up to my expectations of real punjabi food I know and love. The owner informed me that they are always trying out new deals for different occasions. 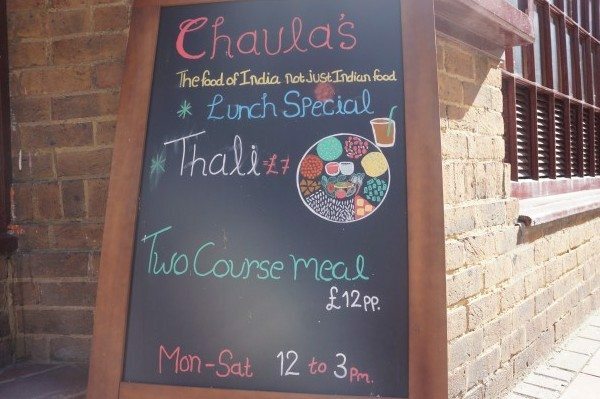 When we arrived we could see on the sign outside that they were offering Thali trays for £7 on their lunch specials, or two courses for £12pp (available 12 to 3pm). 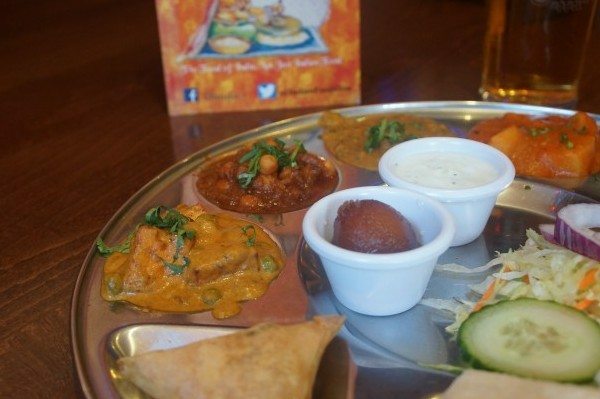 With plenty of classic Indian dishes to choose from, particularly a great selection of vegetarian and vegan options, it’s no surprise that the offers were enticing a lot of groups into the restaurant, despite it being a sunny bank holiday afternoon. Sat near the window, we overlooked the restaurant taking in its personal characteristics, enjoying the faint sound of rhythmic indian music playing in the background. The interior was intimate, cosy and felt instantly inviting. I was in owe of the beautiful décor, the glittery chandeliers, the colourful ornaments, and the grand painting that adorned the back wall. We both gravitated towards it, and studied the intricate details of the characters – we felt as if we had stumbled across a beautiful part of rural india, home to the flavours of our impending meal. 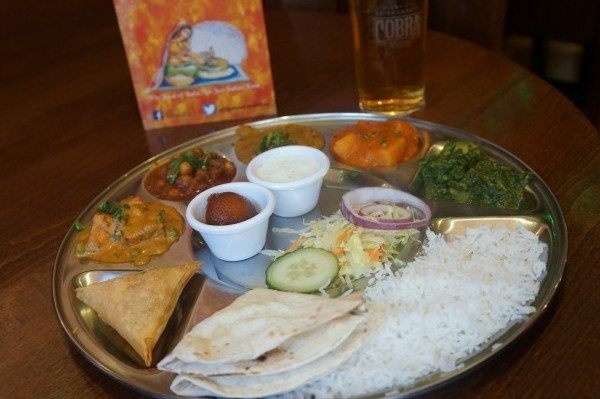 We decided to sample the Thali trays, as it’s the best way to try a selection of dishes in one. Thali trays are a traditional way of eating in Gudwaras, and southern parts of India. The idea behind it is to offer a perfect balance of 6 different flavours – sweet, salt, bitter, sour, stringent and spicy in one serving. 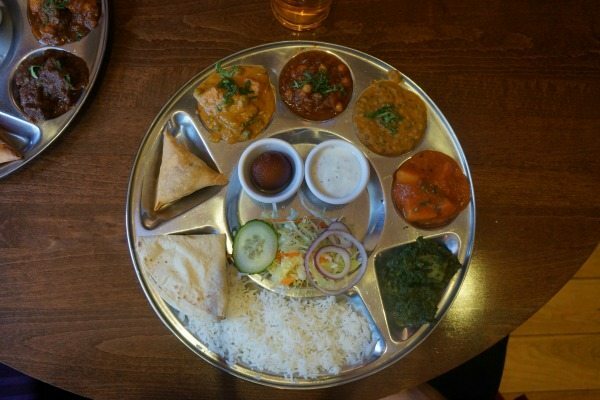 With two easy choices, I decided to try the meat Thali, and my partner went for the vegetarian. With hungry bellies and wide eyes, our lunch Thali trays were laid in front of us in traditional steel plates – the colours were bright and beautiful and the mix of aroma’s consumed the air. The waiter mirrored our smiles, and confidently went on to tell us what each compartment held. The meat Thali contained: a Chicken Samosa; Lamb Lucknovi (mint, tomato and spiced lamb curry); Hyderabad Chicken (originally Chaula’s most popular chicken curry); Murg Makhani (a yoghurt and creamy curry made with cashew nuts, ginger and garlic paste); Sag Aloo; Moong Dhall; one Chapatti; Rice; Raitu (yoghurt and cucumber); salad, and a Gulab Jamun (sweet). The portion sizes were small and manageable, but packed with punches of flavour. The chicken was soft and succulent, and the Makhani was nutty and creamy – it felt so indulgent with each mouthful. I could tell why the Hyderabad Chicken curry was Chaula’s popular dish with diners – the tomato infused with garlic, ginger and chilli is simple yet perfectly satisfying wrapped in a generous handful of chappati. You can tell the succulent Moong Dhall and the sauces in the dishes are made with home-made techniques and flavours that are concentrated with a unique blend of spices from an Indian ancestry – quite different from bland British takeaway curries. Flaky and tender, the meat of the lamb was perfectly marinated in fresh mint, ginger, garlic and spices, and tasted exquisite dipped in the Raita yogurt. Lamb curry is a hard dish to master but the texture and tastes, for me, made it the winning dish out of the lot. 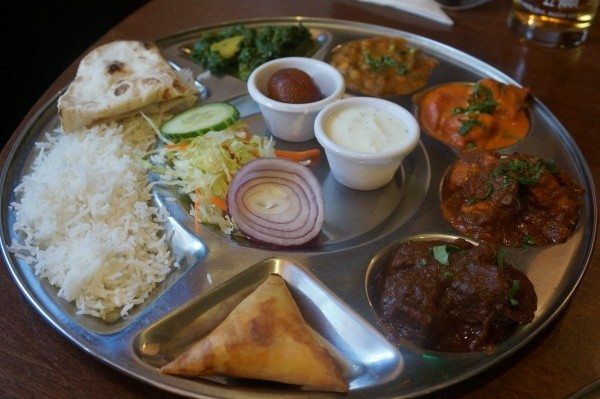 My partners Vegetable Thali consisted of: a Vegetable Samosa; Sag Aloo; Bombay Aloo; Moong Dhall; Chana Masala (chickpea curry); Mutter Paneer (curry of cubed cottage cheese, potato, peas, cashew nuts); one Chapatti; Rice; Raita; and Gulab Jamun. I couldn’t resist the temptation of sampling the Bombay Aloo, the Paneer and the chickpea Chana, as these are traditional Punjabi inspired dishes I love, and was in fact the first Indian dishes I learnt to make. They tasted how I imagined it would be, and for a short second the flavours took me back to my childhood, inconspicuously tasting a spoonful of my Nan’s curry from her huge steel pan. 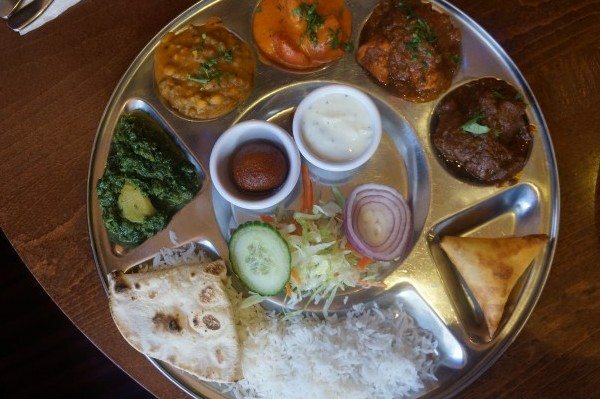 We both loved how we could pick and mix each dish on the plate – that’s the beauty of a Thali tray, experiencing an array of flavours and textures together. Almost full to the brim, we had a little room to fit in the sweet Gulab Jamun. As my partner looked at it curiously, I went on to explain that its a very sweet but a tender delicacy in India – and one which I remember loving as a child. It’s extremely syrupy, with a nutty and doughy texture – a naughty but delicious treat to end the meal. 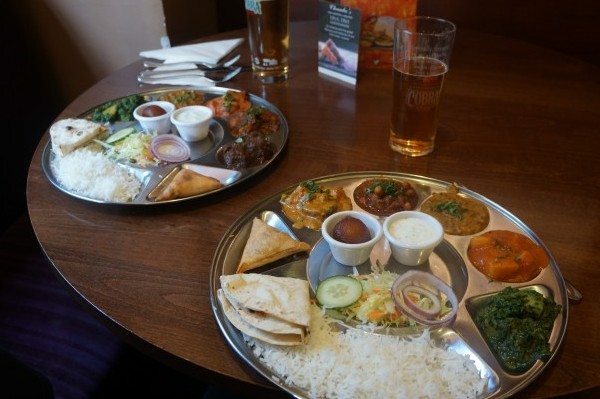 At first we were a little apprehensive about having a lot of rich food for lunch, but the Thali tray is a perfect size, and the option of having multiple tastes is a wonderful experience in itself – and for £7, it’s extremely good value for money. It’s definitely a great way to entice more people to return for the evening and try out more of the dishes – it worked for us, and I certainly can’t wait to go again!